I remember when I was a kid, wow that makes me feel old, but we had snowy Halloweens some years and this year it doesn’t look like it will be at all. But that’s not what I’m chatting about today. I have decided, as I told you last week, that no more Halloween and Fall patterns this season. Sadly, I just need to be on top and make sure I put out some patterns you all will be able to use and appreciate before the season is over. Ya know? So it’s on to snowflakes! I’ve got quite a few ideas I hope I get to design and get out before the season is up. 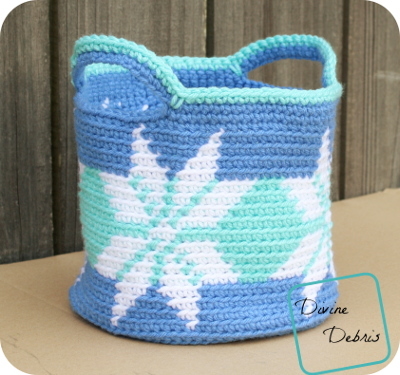 This week’s design uses last year’s Snowflake Purse‘s very traditional looking snowflake but makes it into a basket. I use some sturdy Caron One Pound for this design and I really love the pretty Winter vibes I’m getting from this basket. I think a nice purple might have made a good accent color for the handles but I wanted to keep it down to 3 colors for this design. I do hope you like this basket and give it a try, especially if you’re like me and already thinking of Winter ideas. This pattern is worked in the round, with a slip st into the first st of the rnd. This pattern is worked from the bottom up in 3 sections: the base, the sides, and the handles. The ch 1 at the beginning of the rnd does not count as a stitch. Following the base, sc into the back loop only, until you get to the handles. At the end of the rnd, slip st into both loops of your 1st st, this will help to keep your seam straight. Color A is dark blue, color B is white, and color C is light blue. Caron One Pound was used for colors A and C (Pale Royal Blue and Aqua respectively, 1 – 1.5 oz each) and Loops and Threads Impeccable was used for color B (white, less than 1 oz). The repeat on this is 20. If you want to make this basket larger, keep increasing the base as written here and make sure your final row has a stitch count that is divisible by 20. Every rnd of the sides are worked into the back loop only. Every stitch in the Sides portion of this pattern is a single crochet. The following directions will only tell you what color (ie: Color A, Color B, etc…) and the number in the parentheses tells you how many stitches to make. Fasten off color C. Weave in all your ends. Hi, I love your patterns. So nice of you to offer some for free and very low cost. 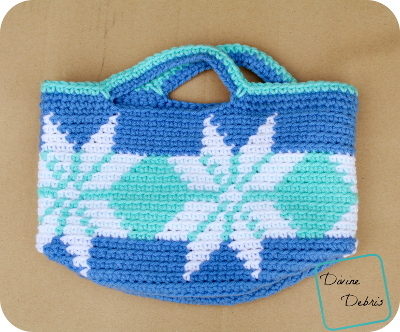 I was looking at the snowflake basket and purse patterns and wondered if the paid version also has a chart.